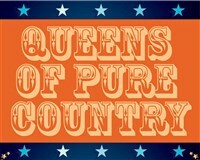 Country hit songs will continue to live on with Queens of Pure Country, featuring hits from country greats from yesterday and today at Hunterdon Hills Playhouse in Hampton, New Jersey. This dinner theatre experience will showcase the music of artists such as Patsy Cline, Kitty Wells, Loretta Lynn, Tammy Wynette, Dolly Parton, Dottie West, Barbara Mandrell, and Reba McEntire, and will also be featuring The Josie Waverly Band. You don't want to miss this blockbuster country music event. We will enjoy lunch at Hunterdon Hills Playhouse before Josie Waverly takes the stage in a tribute to country music's most legendary ladies! Ms. Waverly will capture each hit song with the style and poise that has earned her the title, "New York State's Queen of Country Music."